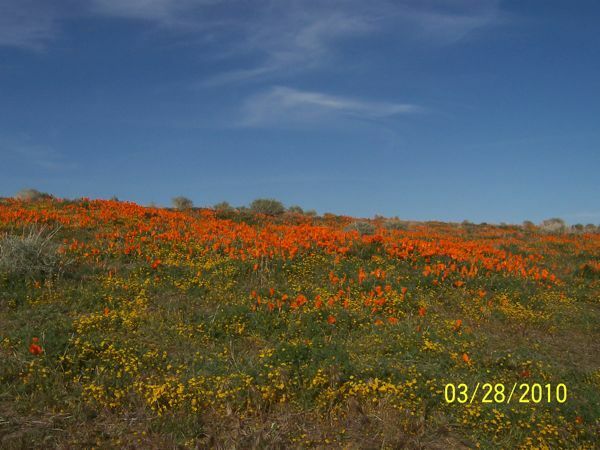 Yesterday Chick and I traveled to the California Poppy Reserve. Although we had some good Spring rains we are still in drought mode. The color was about 30% of what I expected, but a local resident told me that it was better than last week. We have rain fore-casted for this coming Thursday and they are hoping that it will be enough to encourage more blooms. There is a small economy in the area that does much better when the tourists are flocking in to see acres and acres of Poppies, Purple Lupine and a couple of smaller wildflowers I’ve never identified (like the yellow ones in the foreground) filling the valley and the sides of the mountains. However, and happily, the trip did result in several photos like the one you see above for me to use as painting subjects. So, hopefully tomorrow I can post one! Or, at least soon. 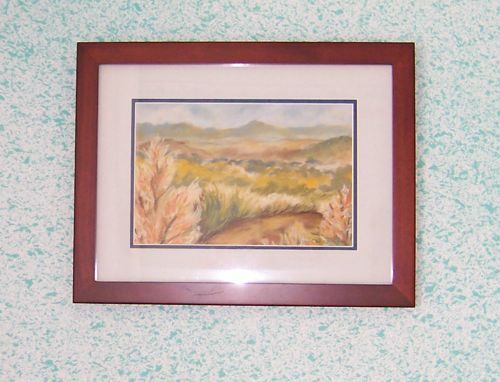 The paintings shown above are pastels that are now on view at a chiropractor’s office in Los Alamitos. This is part of a “revolving gallery” so to speak sponsored by the Lakewood Art Guild. The Guild has through the years contacted businesses that were interested in having original artwork on view in their waiting rooms, etc. The paintings are changed every 2 to 3 months (depending on how busy the head of this activity is! ) The first three are obviously on one wall and the single picture is in an alcove near the main reception desk. Unfortunately, I was there with the artist that was taking her work down and the time of day wasn’t the best for lighting, reflections, etc. I’m planning on going back in the morning when the light will be better for photos. Also, the hooks on the walls in all locations are permanent, so in this case, the spacing may be less than ideal because they were allowing room for larger paintings than I had available for display. I’m planning on replacing the two smaller ones with larger pastels sometime in April. I think I’ll be happier with that…..and the people at the office will be seeing even more art! Sounds like a win/win to me. If there are any Southern California people interested in seeing my pastels, the business is called Alamitos Chiropractic and Nutrition Center at 11274 Los Alamitos Blvd,, Los Alamitos (Dr. Cynthia Burkhardt, D.C. is the owner). It’s not too far off the 605 freeway in the Von’s Shopping Center. If you do visit, I’d love to hear any comments you may have.